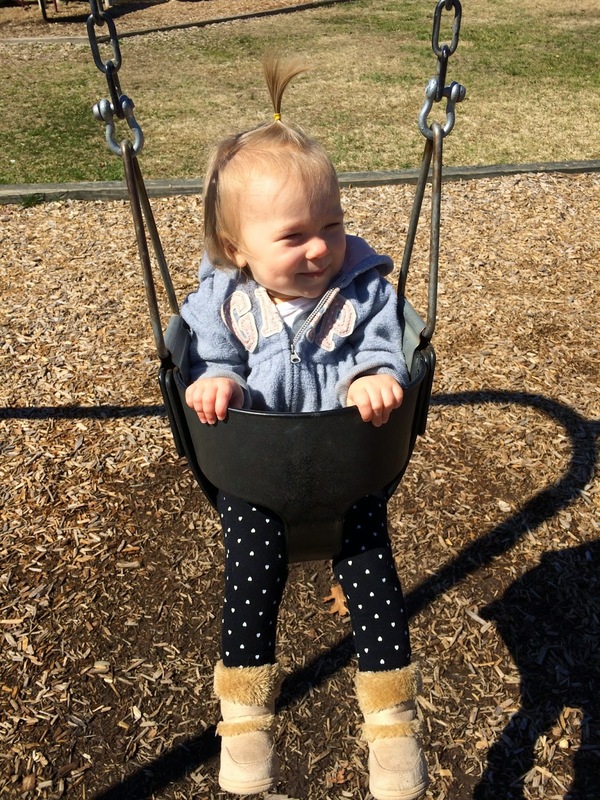 Over Aven’s first year, I did monthly updates on her recent milestones, our current routines, & moments I wanted to remember. Rather than continuing to do these monthly, I’ll pop in from time to time when we’ve had some changes in routine or recent updates I want to track and share. 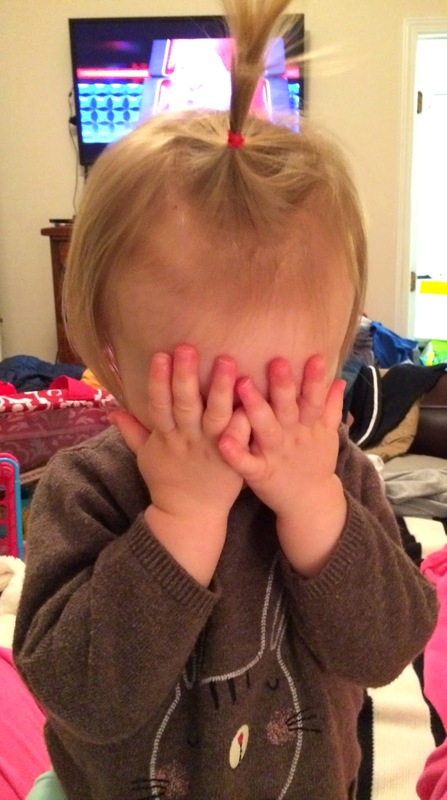 She is now 14 months old, or the simpler and less annoying way of saying it: She is a little over one year old. 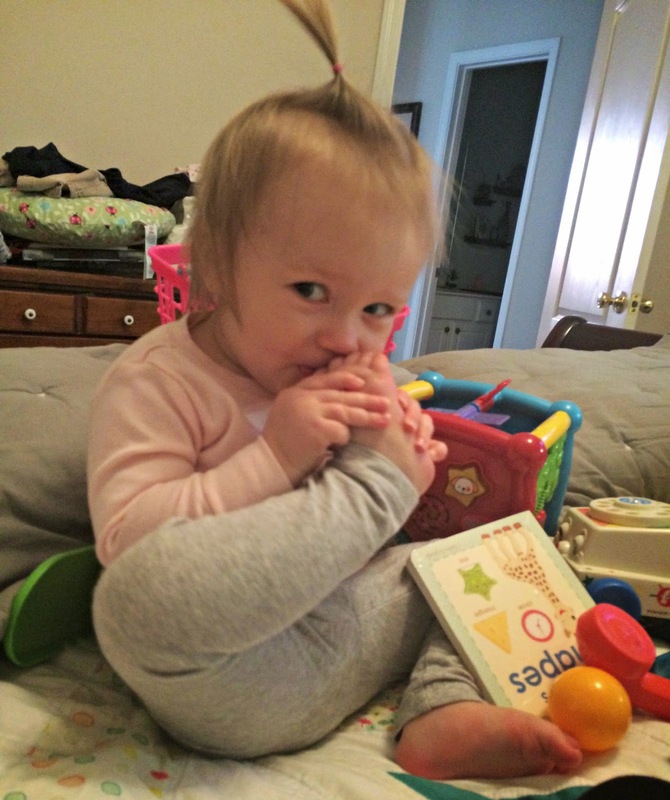 Most fun lately for me has been watching her learn new things practically every day and her growing vocabulary. She’s a griper by nature – she always has to be making some sound and communicating in some manner. I’m encouraging her to use the words she does know whenever she can and I make sure to acknowledge quickly so she sees it’s more effective than a gripe or a whine. Most fun lately for her has been walking! She’s so good at it now and face plants less often which we are all happy about. 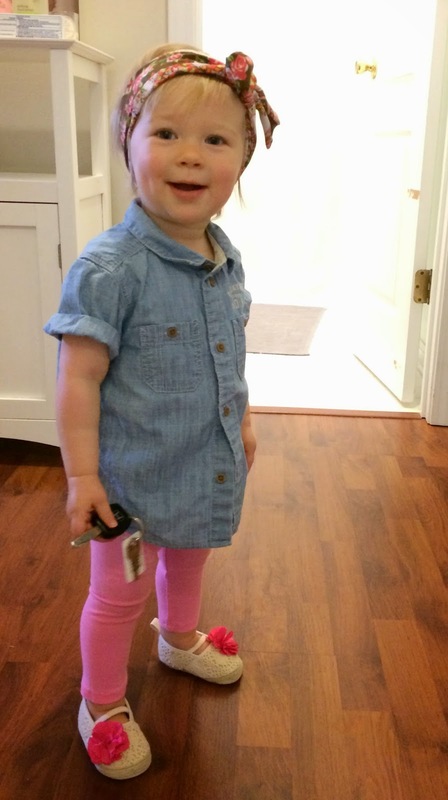 She is content to just toddle around whatever room I’m in most of the time. Usually carrying some semblance of a purse. Such a GIRL. Worst moment lately was when she fell off the bed last week. Part of me was all yay, we made it 14 months before a fall off the bed! and the other part of me hurt way more than she probably did. Not only did she fall off with me sitting next to her (you can give me my Parent of the Year award later) but she fell onto her Mamas&Papas Seat that I had just set down next to the bed. It was pitiful and scared her half to death. I called my firefighter/EMT father and my pediatric nurse friend and we all concluded that she would, in fact, survive. 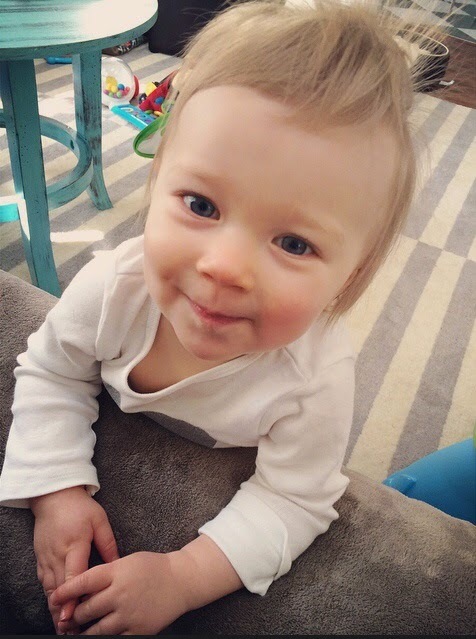 Signs: more, eat/food, please, bath, diaper (just points at diaper repeatedly). 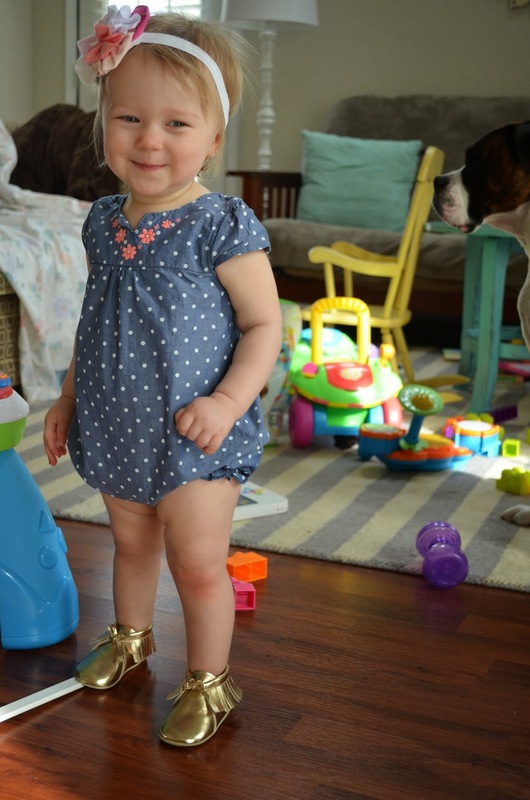 New words: Toe (but she says “no”), up, down, turtle (says “tuh-tull” – so presh), eye, bracelet (sort of), hot, night night, owl, hoot hoot, ribbit (it’s really just a growl sound whenever you say frog), moo. Teeth: getting 2 top molars and 1 bottom molar. These are taking their sweet time coming in which I feel like has been easier for her to tolerate. This banana toothbrush doubles as a teether in our house. It’s really pliable and the bristles feel good on her gums. Routine/Food: She is still taking three full (8-9 oz) bottles per day, along with one 4 oz bottle just before bed (mostly for soothing/routine purposes). She practically hyperventilates when she sees a bottle warming up so I’m not in a big hurry to get rid of them yet. She eats a bowl of oatmeal every morning and LOVES it. Finger foods and snacks include crackers, cheese, granola bars, rice cakes, puffs, cheerios, fruit, yogurt, & bread, along with water (no juice yet). We still do at least one jar of baby food per day (usually something with meat). 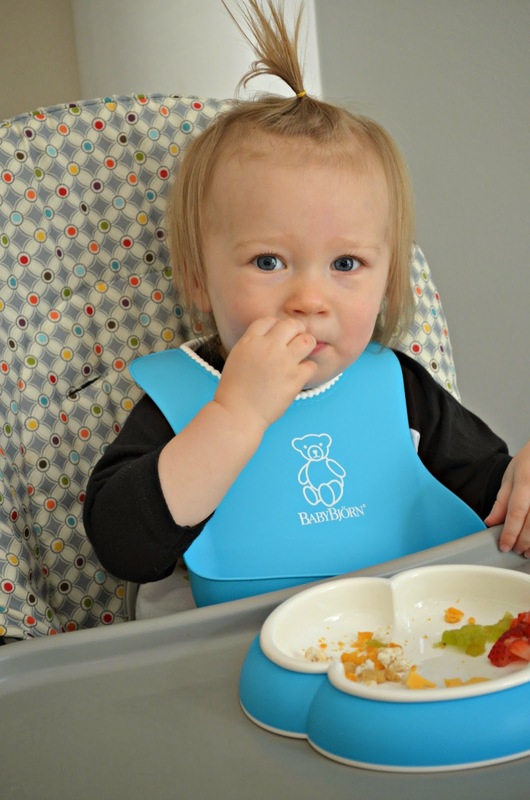 We have been using these new Baby Bjorn bibs and bowls for mealtime and they’ve made our lives so much easier. I really wish I had these back when we first started solid foods! 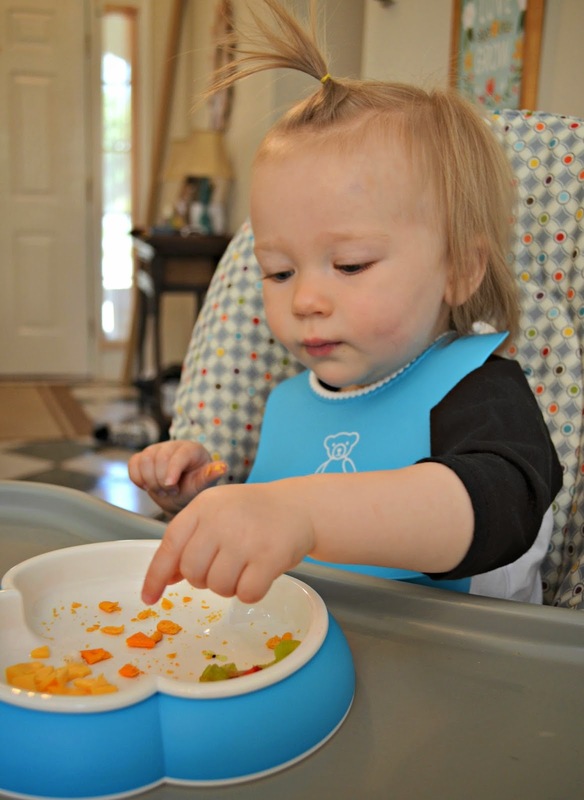 The Soft Bib has a clasp-type closure so even my girl who typically rips bibs off in two seconds can’t figure this one out. Since Aven is feeding herself, my floors (and dogs) see an absurd amount of crumbs after each meal, but this BB bib has a spill pocket along the bottom to catch all the mess. I’m pretty thrilled about not having to clean outfits, highchair seats, AND floors after each meal. That is a huge deal. RIGHT? (Although I’m pretty sure my dogs are wishing the crumb catching bib would just disappear completely.) 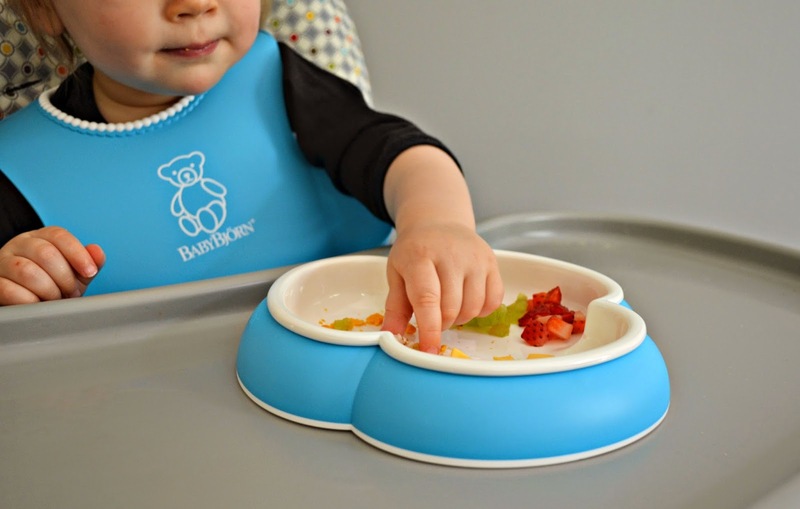 The BB Plate is clover-shaped and really deep which keeps the food contained and easier for them to scoop out on their own. can climb up onto our futon by herself. obsessed with her toes. (She kisses them all the time, photographic evidence below). first bang trim (wahhh I didn’t want to but I had to). 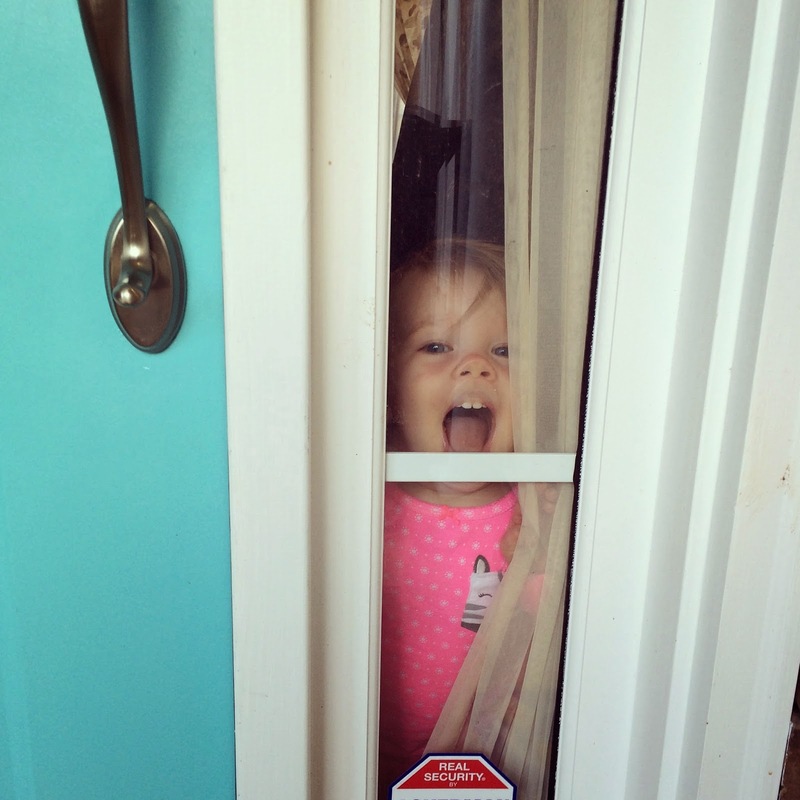 knows how to knock on a door. Lastly, we had an amazing Easter celebrating our risen Savior! 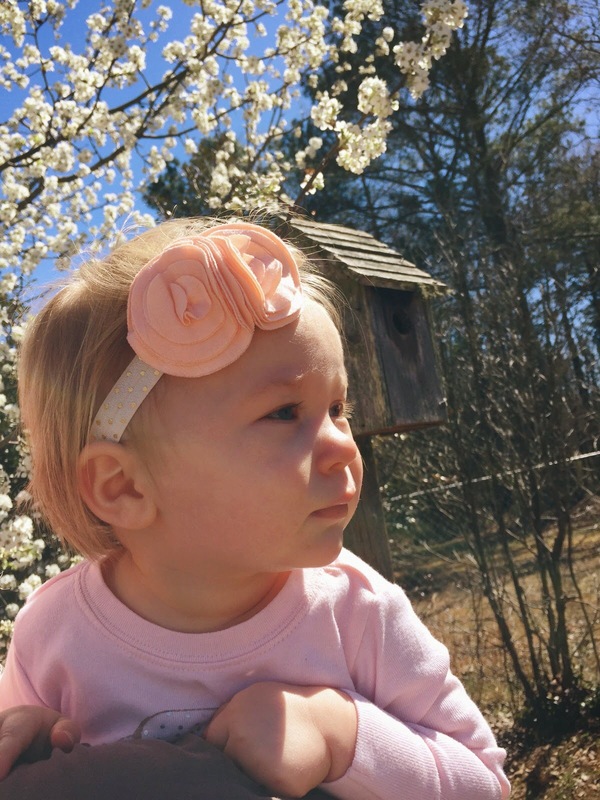 Aven was tiny last year – only about two months old – and actually had her first sickness over the Easter holiday. This year was so fun teaching her how to hunt eggs, and even though she isn’t a fan of the grass (like I said, such a GIRL), she did enjoy carrying her basket around. 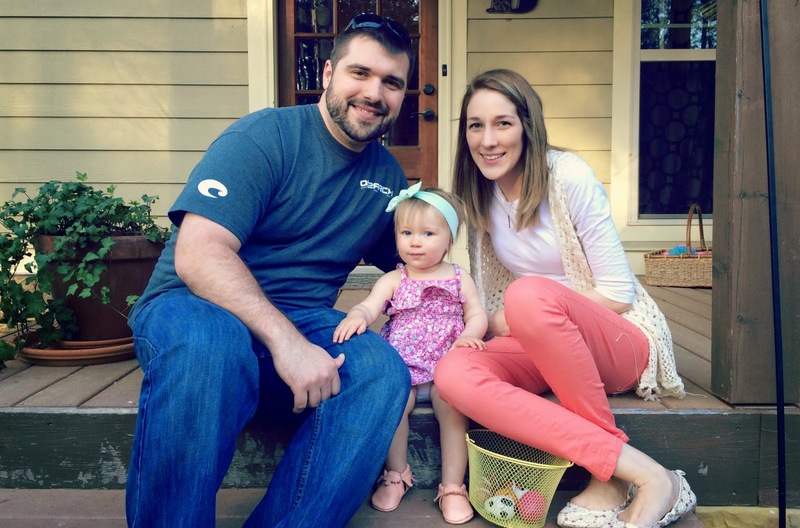 I can’t wait for the coming years when we’ll get to teach her about why Easter is so special and meaningful. Disclaimer: I received the Baby Bjorn products for review as part of the Savvy Sassy Moms Product Scouts program. All opinions are my own.